At Roy Rogers Body Shop, we’ll restore your peace of mind and take care of your car. After an accident, you shouldn’t have to run around getting estimates, arranging car rentals, or dealing with insurance companies. Bring your vehicle to us and let us make the collision repair process simpler. All you have to do is call the insurance company and give the details of your claim and let them know your car will be at Roy Rogers Body Shop. You can drop your car off at our shop, or we can pick it up. We will help you get a rental car to get you back to a normal routine. You don’t have to worry about anything else! We’ll inspect your vehicle, detail the damages, provide an estimate to the insurance company, meet with the adjusters, and get approval to repair your car. The talented technicians at Roy Rogers Body Shop in Laurel, MS have years of experience in collision repair. We provide the latest tools, technologies, and equipment to make your collision repair experience as efficient as possible. You want your vehicle back in its original condition and that’s what our team can promise you with our service expertise. Our team can complete any type of collision service from fixing small dents and scratches to performing extensive frame repairs. We accept most forms of insurance and offer a comprehensive list of complete collision repair services. Any accident can leave a driver feeling uneasy about their vehicle’s repairs. 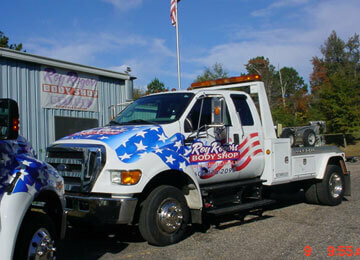 At Roy Rogers Body Shop, we make the repair process as smooth and hassle-free as possible. Let the friendly and professional collision repair staff at our Laurel, MS body shop turn your traumatic event into a positive experience. We’ll walk you through each step of the collision repair process. Our goal is to make certain you are always informed, comfortable, and satisfied with your service experience. You can rest easy knowing our collision repair technicians will handle each repair project with the time and respect it deserves. We want to get you back in your vehicle as quickly as possible.